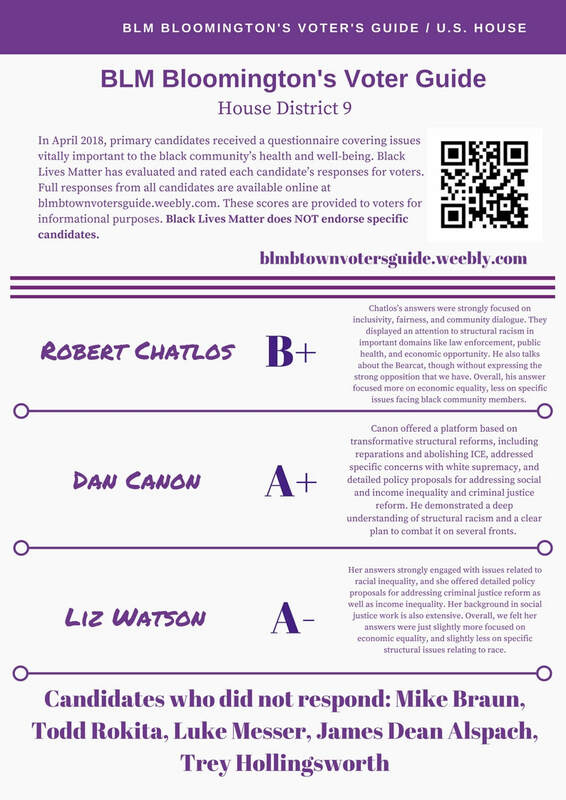 In April 2018, primary candidates received a questionnaire covering issues important to Black Lives Matter Bloomington. Black Lives Matter has evaluated and rated each candidate’s responses for voters. Candidates were evaluated based on how their responses to the questionnaire showed a specific knowledge about issues of structural racism in our community, a clear interest in combating these structures, and a self-awareness of the candidate’s own positionality with regard to race. These scores are provided to voters for informational purposes. Black Lives Matter does NOT endorse specific candidates. Candidates are invited to revisit their answers at any time. 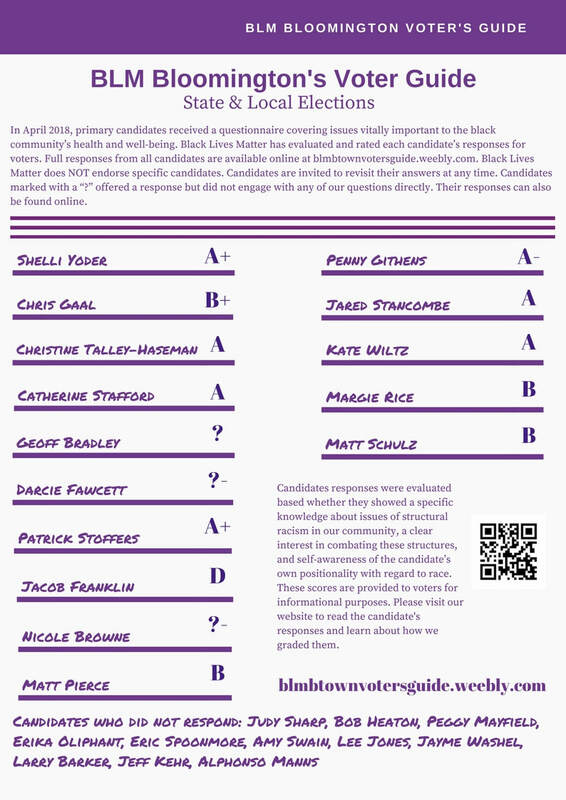 ​Candidates marked with a “?” offered a response but did not engage with any of our questions directly. All of the candidates' responses can also be on this website. I am not a politician, I am running for Indiana House district 46 for the people to have a voice in the partisan politics of the last century. Indiana has made some significant movements toward greater justice for all Hoosiers, but in the last 10 years, the decline of support for the working and middle class citizens has been wiped away. The cry of our rural and inner city Hoosiers is far too deafening to not stand for justice in this time and place. I would love to sit down with you all and discuss some of my ideas to bring Indiana to modern times, but the need is too great to list in one small answer. The first bill I would bring to the floor is a hate crimes bill. We are one of 5 states that does not see the need to protect the most vulnerable, and for the last 20 years we have tried to shamefully argue who has rights in this state and who does not. The second form of injustice we have in Indiana is privatized prisons. Not only are we saying that rehabilitation is not available, the state has signed paperwork to keep prisons and 90% or greater. This is inhumane and unjust. I believe that if we start with legalization of marijuana, then those who are being incarcerated for possession have and equal field as those who are overlooked. We must also not forget to begin to offer transition housing and education for all who leave these facilities. Point 3- healthcare is a basic human right. This means that wherever you live, and whatever you make, we should be able to get the same level of care regardless. Instead of shuffling those who suffer from mental illness into prisons or jails, we should have recovery centers across the state. As time is short for me, I would encourage meeting with you should you have any questions. I apologize for the short answers to some of our greatest issues. I am the grandchild of immigrants, I am what happens when dreamers are allowed to dream. Social justice is not just the marches I have walked, but the every day I stand. The moving to a rural community and running for office. The asking of questions when a dark thought is said. The building of hope in the face of so much hatred. There is not enough room in one day to list the injustices the legislative branch has bestowed upon the lack of freedom, health and safety in this state. When you restrict rights of workers, cut federal subsidies, and cut funding to EMS, you are only hurting the most vulnerable populations. This is why I run. I rely on those around me, the real people of this state to assist in donations. I have received 2 checks from unions, and have mostly received from people at speaking events and one fundraiser I held. I do not accept lobby money. Should you want to support my campaign, checks can be made payable to Change for the People. I would ask that you allow me the space to come and speak with you all before sending a check so that we can work together for change. I apologize for the rough nature of responses and have so much more to say. I do not give political answers, I speak on every issue individually. This state is in a downfall free fall and we must change it for the people who work and live here. Thank you for this time and consideration. With my cognitive psychology experience I have the ability to formulate unlimited questioning, create indefinite forms of communication, and legally/respectfully address conflict. The retail and hospitality background I have promotes a worker-focused approach in every interaction. My professional experience in hospitality operations management gives me the background of exhibiting professional judgment and diplomacy in handling unexpected problems and frequent interruptions as well as supporting and monitoring vast teams at different locations simultaneously. My work as an EMT, lets you know that I am ready and willing to face anything at the drop of the tones. Above all, I have worked manual labor since I was 9 and look forward to serving ALL Hoosiers!